They say that one is a lonely number. When it comes to cars, specifically a one of one like today's Nice Price or Crack Pipe Shelby CSX clone, it's not lonely, it's exclusive. Will its price also prove to be one of a kind? Bus stop rat bag, ha ha charade you are. You may not know it, but the bus stop that Pink Floyd was referencing in the 1976 song Pigs (Three Different Ones) was specifically NOT that which would have been served by yesterday's 1972 Mercedes Benz O 309D. That's because the English Rockers weren't actually all that familiar with public transportation. You could become so acquainted, and with its 60% Nice Price win, you could feel confident that the purchase was money well spent. Do you remember when the Ps replaced the Ks? It was back in 1987 when Chrysler decided to give the venerable Aries/Reliant the heave ho, and replaced them with the smoother-styled, and more hatchback-ier Shadow/Sundance twins. The new cars totally looked like they belonged in the same family as the larger LeBaron and Lancers, and not as though the milkman had anything to do with them. Carroll Shelby on the other hand, had plenty to do with these cars, much as he had previously had with the L-body Omni. The Shelby CSX (Carroll Shelby experimental) would eventually be turned out in Shelby's California plant, each one featuring prom night hotness over the standard cars' plain jane-ness. The Shelby-kissed cars upgrades included the 175-horse Turbo 2.2, a 5-speed stick, and handling improvements to make them, in the end, pretty reasonable performers. The initial mules were all 4-doors as those were the first to be made available to Shelby by Dodge, while the production cars were all three-door hatchbacks. All were produced between 1987 and 1989, after which Shelby didn't build special editions for Dodge. Shelby never made a CSX in a convertible edition. Let me repeat that, Shelby NEVER made a convertible edition - not even as a prototype, a masturbatory fantasy, or a peyote-initiated fever dream. 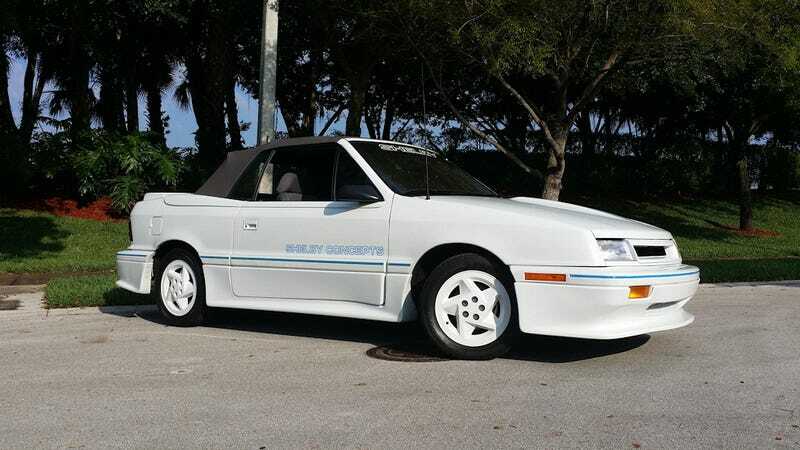 And that's what makes today's candidate, which is advertised as a 1991 Shelby Dodge CSX convertible, just so vexing. The car looks to be the real deal, right down to the Shelby-emblazoned Recaro bucket seats and floor mats, and the ground effects bodywork. It's also claimed to have only 18K on the clock. Both of those elements, as presented, should be taken with a grain of salt. Why? Well, have a look at this ad from Turbo-Mopar.com dating back to April of this year. Yep, your eyes aren't deceiving you, that's the very same car - and in fact the very same pictures. The seller in that ad is VERY up front about the car NOT being a Shelby, but one that has been created in its master's image. It's based on a car that has been totally rebuilt - after having served 100,000 miles. Its asking price back then? $9,500. Now, to be fair, the current seller says in his ad: "This car was never produced/ manufactured. Had the relationship with Carroll Shelby and Dodge continued, this may have been the result." He also calls it a 1991 Shelby Dodge CSX Convertible Prototype in the title so I give him the Gumby brand one-size-fits-all condom award for stretching the truth. The question for us all is whether or not someone should give him $11,500 for this homage - but extremely nicely kitted - Dodge. I think I know what the result will be (cough-landslidecrackpipe-cough) but who am I to speak for you? Also, I want to point out that when I captured the ad eleven-five was the price. I don't know why it is now $22,500, but eff the hell out of that. What do you think, is this Dodge worth $11,500? Or, is it just too dodgy? H/T to Mark McIntosh for the hookup!